A caring token of remembrance, this meaningful piece is lovingly engraved with »Unseen, unheard but always near. Still loved, still missed, still very dear«, a truly deep expression of the love you carry in your heart. 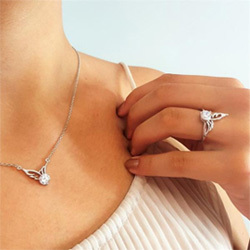 A delicate angel wing is added to the pendant creating that unique Linda's Stars look. It was beautiful. Wish it was in a box with your name on it so giving it as a gift they would know where they could get more. The keychains are very nice. Well made. Thoughtful and caring gifts. Thank you for your prompt shipment!